A pickled cucumber, most often simply called a pickle in the United States and Canada, is a cucumber that has been preserved and flavored in a solution of vinegar, brine, often with spices, sugar, or other flavorings. The term pickle is also used in a broader sense to refer to any vegetable, fruit, or other food preserved in a brine or vinegar mixture, such as the pickling of cauliflower, olives, watermelon rind, cabbage, onion, pepper, herring, and onions. However, this article will be specific for pickled cucumbers, with cucumbers the most well-known and commonly pickled food. Human beings, utilizing their creativity, have taken the cucumber and developed different varieties of cucumbers and many types of pickled cucumbers. Pickles vary according to the spices and other ingredients used in the process and the type of cucumber. Among diverse ingredients utilized to make uniquely flavored pickles are aromatic spices such as dill weed—for all types of dill pickles—cinnamon, cloves, and nutmeg; hot spices such as black pepper, ginger, and mustard; and herbs such as basil, and thyme (Romanowski 1996). Some pickles are sweet, with sugar added, and some are produced with onions and garlic. The pickles produced are used in a variety of ways, such as eating directly, or as a condiment, or in various dishes. Cucumbers were probably first pickled 4400 years ago (2400 B.C.E.) in Mesopotamia (Terebelski and Ralph 2003). In India, pickles were well known by the Vedic period (BM 2007). In two passages in the Bible (Numbers 11:5 and Isaiah 1:8), cucumbers are mentioned and history traces their first use over 3,000 years ago in western Asia, Egypt, and Greece. Cucumber pickling might have spread through the Jewish diaspora. The pickling process was also known to the Ancient Greeks. Aristotle is reported to have praised pickled cucumbers, around 850 B.C.E., for their healing effects (Terebelski and Ralph 2003; BM 2007). Julius Caesar's soldiers ate pickled cucumbers as health aids (BM 2007) and many other brine-soaked foods were part of daily life in Ancient Rome (Kurlansky 2002). Cleopatra attributed her beauty to a diet of pickles (Terebelski and Ralph 2003; BM 2007). Cucumber pickling remained widespread across the Levant and Maghreb regions, where it is still very popular today. Pickled cucumbers were popular with travelers to America because they were not only nutritious but also did not spoil in the long voyage from Europe (Romanowski 1996). Interestingly, Amerigo Vespucci, from whom America gained its name, was a pickle salesman who was the main supplier to many ships (Romanowski 1996). The selling of pickles in jars in 1820 by Nicholas Appert represented the first large-scale commercial production (Romanowsky 1996). Pickled cucumbers offered by a roadside stand in Lithuania, near Kėdainiai, July 2006. Six basic ingredients are used in making pickles today: bulk food (cucumber), acids, flavorings, colorants, preservatives, and stabilizers (Romanowsky 1996). The primary ingredient used on the cucumber is acetic acid, the key ingredient of vinegar. Vinegar is a sour liquid produced from the fermentation of diluted alcohol products, which yields the organic compound acetic acid. It is used in many cultures as a condiment and preservative. Vinegar, which must be derived from a sugar-containing source in a two-step process, can be made from a variety of liquids, with the different sources impacting the taste of the pickles. After vinegar, other ingredients commonly used are sugar, salt, flavorings, and colorants. Sugar, or artificial sweeteners, may also be added to provide a sweetness to offset the vinegar's sour taste (Romanowksy 1996). Salt may be added for flavor and to enhance vinegar's preservative effect. The addition of flavorings in the form of spices and herbs make different types of pickles; for example, dill weed is an aromatic spice used to make all forms of dill pickles (Romanowsky 1996). Colorants are not normally needed, given the acceptability of the natural color of pickles, but can help to create a standardized product and overcome the effects of the processing (Romanowsky 1996). Cucumber pickling is almost universally done through a brine fermentation process. Brine is water saturated or nearly saturated with salt (NaCl). Ripe cucumbers are selected, washed, and salted thoroughly, and then added to a brine solution for a number of weeks to ferment. Vinegar, sugar, spice and other ingredients can be added to the process, depending on the technique used. There are many types of pickled cucumbers, varying according to the spices and other ingredients used and the type of cucumber. The most common are dill pickles, with all forms utilizing the aromatic spice dill weed. Other aromatic spices that may be used are cinnamon, cloves, nutmeg, fennel, cassia, and so forth, for hot spices may be used such as black pepper, ginger, mustard, and capsicum (Romanowski 1996). Such herbs as basil, thyme, and so forth may be used for a unique flavor, and onions and garlic may be included (Romanowski 1996). Some are sweet, with sugar added. A gherkin is not only a pickle of a certain size but also a particular species of cucumber, the West Indian or Burr cucumber (Cucumis anguria), which is different than what is technically known as the cucumber (Cucumis sativus). Standard pickles are made from the West Indian cucumber, but the term gherkin has become loosely used as any small cucumber pickled in sweet vinegar brine, regardless of the variety of cucumber used. A "kosher" dill pickle is usually not kosher in the sense that it has been prepared under rabbinical supervision, which would ensure that no utensil in contact with the pickles had been in contact with food that was not kosher. Rather, it is a pickle made in the traditional manner of Jewish New York City pickle makers, with generous addition of garlic to the brine (Terebelski and Ralph 2003; Rich 2007). Polish style pickled cucumbers (Polish: ogórek kiszony) are a type of pickled cucumber developed in the northern parts of Europe and have been exported worldwide and are found in the cuisines of many countries. 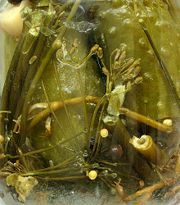 As opposed to some other varieties of pickled cucumbers, they are prepared using the traditional process of natural fermentation in a salty brine, which makes them grow sour. There is no vinegar used in the brine of a Polish-style pickled cucumber (Ogórek kiszony). Typically, small cucumbers are placed in a ceramic vessel or a wooden barrel, together with a variety of spices. Among those traditionally used in many recipes are garlic, horseradish, fennel, cumin, oak, and cherry leaves, and—most importantly—salt. The cucumbers are then placed under clear water and kept under a non-airtight cover for several weeks, depending on taste and external temperature. The more salt is added the more sour the cucumbers become. Since they are produced without vinegar, a scum forms on the top, but this does not indicate they have spoiled, and the scum is just removed. They do not, however, keep as long as cucumbers pickled with vinegar. Bread-and-butter pickles are sweeter in flavor than dill pickles, having a high concentration of sugar added to the brine. Rather than being served alongside a sandwich, they are more often used in fully-flavored sandwiches, such as hamburgers, or used in potato salad. Much like sauerkraut (also technically a pickle), pickled cucumbers are rich in vitamin C. Cucumbers have a mild anti-inflammatory effect, although how much of this effect is retained after the pickling process is up for debate. Pickles are often served as a "side" to various lunches in the form of a "pickle spear," which is a pickled cucumber cut length-wise into quarters or sixths. The pickle may be used as a condiment on a hamburger or other sandwich (usually in slice form), or to a sausage or hot dog in chopped form as pickle relish. Soured cucumbers are commonly used in a variety of dishes—for example, pickle-stuffed meatloaf, potato salad, or chicken salad—or consumed alone as an appetizer. Pickles have also been introduced in fried form, either deep-fried plain, or with a breading surrounding the spear. Battcock, M., and S. Azam-Ali. 1998. Fermented Fruits and Vegetables: A Global Perspective. Rome: Food and Agriculture Organization of the United Nations. Best Maid (BM). 2007. History of pickling Best-Maid. Retrieved January 6, 2008. Kurlansky, M. 2002. Salt: A History of the World. New York: Walker and Co. ISBN 0802713734. Rich, T. R. 2007. Kashrut: Jewish Dietary Laws "Judaism 101 JewFAQ.org. Retrieved January 6, 2008. Romanowki, P. 1996. Pickle In How Products are Made, Volume 4 (online version). Retrieved January 6, 2008. Terebelski, D., and N. Ralph. 2003. Pickle history timeline New York Food Museum. Retrieved January 6, 2008. This page was last modified on 2 April 2008, at 14:18.